We say SAPT is tested over 8 years. 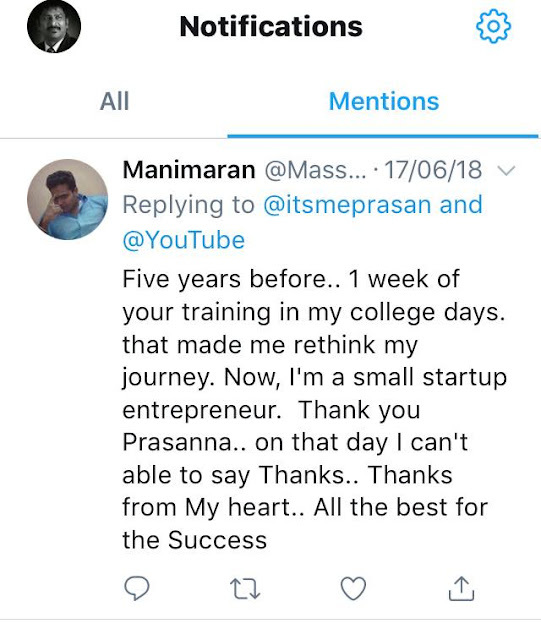 Here is the twitter testimony strengthening our confidence..
"After attending SAPT on 19th August 2018, I have got a new perspective about selling. My confidence is increased. It is totally a different experience"
Vamshi Parthiban, Jaya Sulochana Chitfund Pvt. Ltd., Chennai. "I am working as a Accounts Manager for a financial institution in Chennai. I was just an accountant before attending SAPT. Now, I feel I must do business and become a Branch Head"
"SAPT program was awesome. It was so interactive - the time flew by and I didn't even realize how much I was actually learning! I am totally exited about getting back on the floor, and applying all the concepts and sharing them with my staff"
Thank you so much Vertical Progress..! Royal Bank of Canada - Insurance.